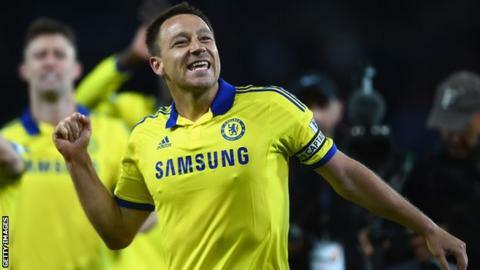 Chelsea deserve "a lot of respect" after moving to within one victory of being crowned Premier League champions, says captain John Terry. Terry scored the Blues' second goal as they came from behind to beat Leicester City 3-1 at the King Power Stadium. He says they deserve credit after being taunted as "boring" by Arsenal fans. The former England captain, 34, said: "We've been the best side all season. We've been very good all season so let's hope we win it on Sunday." The title will be confirmed if the Blues beat Crystal Palace at Stamford Bridge on Sunday (13:30 BST kick-off). Second-placed Manchester City, 13 points behind, cannot overhaul Chelsea but third-placed Arsenal, on the same points total as City, could theoretically pass them as they have a game in hand. Victory on Sunday would give manager Jose Mourinho his third Premier League triumph with the club, and the first since he returned for a second spell in charge. The Blues last won the title in 2009-10, when Carlo Ancelotti was manager. Leicester led at half-time but Didier Drogba equalised early in the second half before Terry and Ramires secured the victory. "We don't get enough credit," said striker Drogba, 37. "We are top of the league, we have the most points and people find us boring because we have been top since day one." Mourinho, who described Drogba's equaliser as "gold for us", said his players had been "phenomenal" during "a month with problems". He added: "This was the month when people were waiting for Chelsea to slip up, to lose one game or draw. "We have played this month without Diego Costa and without Loic Remy, with no other solutions, but this small group were phenomenal. "We were phenomenal tactically, with team spirit, the way we defended, the way we were clinical with our goal and the stability we showed in every game." Mourinho called on Chelsea's fans to inspire the team over the finishing line on Sunday, saying: "I hope our fans walk up to Stamford Bridge not celebrating but to play the match with us and push the team - that is the spirit we have in our group." Leicester manager Nigel Pearson dismissed suggestions Chelsea were somehow undeserving of the position they are in. "I've heard criticism of Chelsea recently and I find it bemusing to be honest," he said. "The best sides are able to win games in different ways and Chelsea illustrated that tonight. "I think they're a really good side and have some great players. I'm not oblivious to the views that were spouted at the weekend in terms of style of football but I'm a believer in winning games and that's it. "Before the game started we knew it was a case of when, rather than if, Chelsea win the title. The result did not necessarily reflect the balance of the game but we played against a very good side who will be worthy winners of the Premier League." "People had been talking before the game, calling Chelsea boring and predictable, but they came here and swept Leicester aside. "You could see Jose Mourinho and his staff at the end were all laughing and joking. They know they are so close to touching the title." BBC Sport's Phil McNulty: "Chelsea showed once more why they will be worthy Premier League champions after they survived a severe examination from Leicester City before overpowering them with strength and class. "Leicester fully deserved their half-time advantage but once Didier Drogba equalised it was simply a question of how long before Chelsea went ahead as they went through the gears impressively. There was an inevitability that was a tribute to the qualities of the team Jose Mourinho has assembled. "With a combination of the old reliables such as Petr Cech, Terry and Drogba augmented by the flair of Cesc Fabregas, Eden Hazard and Willian, Chelsea showed they are a team for all eventualities to move to within one win of the title. "And the visiting fans even took the opportunity to respond to the taunts of Arsenal's supporters as they chanted 'boring, boring Chelsea' in the closing minutes. "The accusation from opposition fans is nonsense and Chelsea proved it again. Mourinho can almost reach out and touch the title now - and the manner in which they have adjusted to all situations with success means it is an achievement that is a fitting reward."